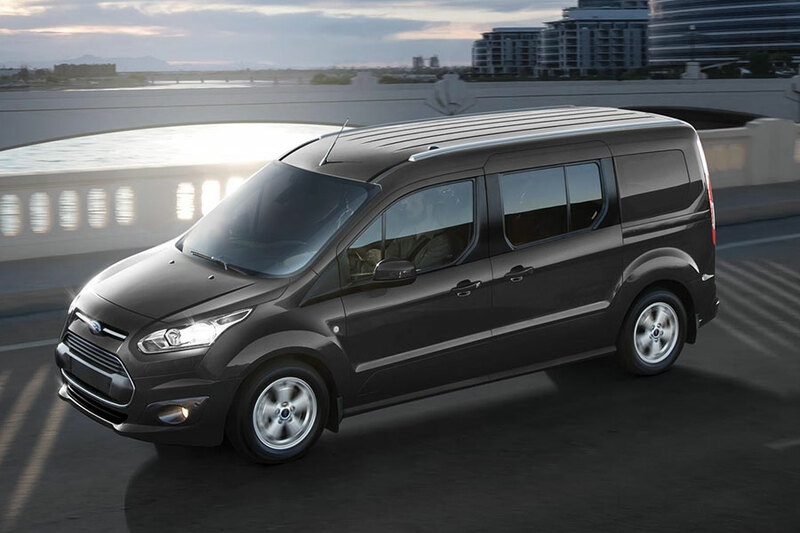 If you're looking for a people or hobby hauler, look no further than the 2019 Ford Transit Connect. The Transit Connect has received an overhaul for the coming year, the first since its debut in 2014. This second-generation all-American wagon is perfect for nearly anyone with a lot of people or a lot of stuff: big families, hobbyists with plenty of gear, sightseers, entrepreneurs with stuff to haul, and those who have trouble getting into and out of most other vehicles. If you fall into one of those categories, read on. The all-new 2019 Ford Transit Connect is literally made for you. The 2019 Ford Transit Connect offers two new engines, new transmission, new tech and driver-assist features, and an exterior overhaul. The engines are both 4-cylinder: a direct injection 2.0-liter with stop-start technology and a 1.5-liter turbodiesel four. The diesel engine, dubbed EcoBlue, is a big deal since it's innovative for this class. Both engine options are paired with new 8-speed automatic transmissions, replacing the 6-speed of last year. You now have an impressive 2,000 towing capacity, 200 lb-ft. of torque to muscle into any load you put in it, and Ford estimates an impressive 30 highway miles per gallon for fuel economy. There's plenty of new tech in the Transit Connect, hinting at the idea that these aren't just cargo haulers anymore. First, the active safety features have greatly expanded. The existing automated emergency braking is joined by adaptive cruise control, blind-spot monitoring with rear cross-traffic alert, lane-keeping assist, and high-intensity-discharge headlamps. Additionally, there's now standard 4G LTE connection serves as a Wi-Fi hotspot for up to ten wireless devices. Road trip, anyone? The final brand-new feature is a revamped exterior. A new nose and LED headlights make the Transit Connect look more like other Ford cars and minivans, bringing the Transit back into the lineup. The interior styling has changed too, with additional padding in the first two rows of seating, a new instrument cluster, and redesigned center stack. The touchscreen now floats above the dash, making room for a convenient cubby for your phone or wallet beneath. Why Buy the 2019 Ford Transit Connect? The Ford Transit Connect is a pretty versatile vehicle, so this van could serve various purposes. With three wheelbase lengths, you can buy the Transit Connect stretched or scrunched as needed. Numerous new safety features make the Transit Connect a great people-hauler for kids, grandkids, little league teams, or carpooling. Take the seats out and you can run a small business out of the back, haul your products or deliveries, or fill the van with gear for your favorite hobby. Model airplanes, fishing poles, golf clubs, and landscaping tools all sound like great options. For those drivers who aren't as spry as they used to be or who have a lot to haul, the Ford Transit Connect offers a waist-high slide-in driver seat together with a 2-foot lift from the ground to the load floor. No matter what you use the 2019 Ford Transit Connect for, you'll find a reliable hauler and smooth cruiser with Ford's distinctive, attractive styling and some smart, innovative design.